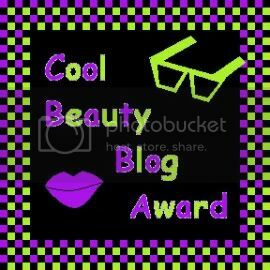 Just a quickie post to announce that I was awarded the "Cool Beauty Blog Award" from Rizzie over at Glamadazzle. So, Ya'll head on over and check out her amazing blog! She is a super sweet blogger! :) She also has a super-duper giveaway going on, so check out that link in my side bar. :) Thank you Rizzie!!! Thank the person who gave you this award (check! See above). Pass on this award to 5 beauty blogs you think are the COOLEST ever, and let them know! I'm Trendy. I adore Fashion!!! I am a Fashion Magazine-junky who loves scoping through the pages to finding the coolest new trends...and following them. I try to recreate looks by "Shopping my own closet", but yes...sometimes new purchases are required! ;) So, my style is somewhat of a merge with classic and trendy...I'm an Urban Hipster, lol! Edgy makeup? Hmm, probably the "coolest" makeup that I go for is in the realm of nail polish. I will pretty much wear any color, but tend to go for the wild colors on the toes. I LOVE glitter polish and love wearing glitter polish on my fingernails! Huge fan of glitter here!!! Other "cool" makeup looks that I go for are purples...purple toned lip colors are my faves lately! Now here is my list of cool blogs (too see links for other blogs that I love and adore, click some of my previous blog awards on my side bar and it will link you to blogs that I have awarded in the past). Thanks for reading and stay beautiful!!! Sure thing Jennifer! You have a great blog! :) XOXO! Wow Pammy you're so on top of it, I can't believe you got that done so fast :) Congratulations on the award ! Hey Tracy! Thanks Doll! And, congrats to you too (as you got this one as well!). Yes, it was good timing for me as I found out about this award right when I was in the mood for some writing! :) xoxo! Thanks for the mention darling! You're Awesome! Well done, great blog, keep it up, enjoy reading this. @Rose-Hi Rose! Thanks so much! I really appreciate your comment!! !